Fellow artists and creatives - do you know that feeling when you seem to lack motivation, drive and ideas? It feels suddenly someone has just removed your creativity fuse. I certainly do. I’ve been feeling exactly like that over the last few months. If you have deadlines or commissions to complete, you often don’t have the luxury of being able to put your hands up and try to identify the cause, you just have to plow on. This can be difficult. If you have the luxury of time, you can put your pencils and brushes down and reflect. I’ve done quite a bit of thinking about this during my “down time”, and as I have worked through this myself, I have written down a few tips that I have found helpful to remember. The ability of the outdoors to inspire probably won’t be news for you, but it’s definitely still worth mentioning. For me, being in nature is a huge source of inspiration, and I definitely don’t think this just applies to botanical artists. You can study people, landscapes, buildings, light, colour; just by opening your eyes and spending time outside (distraction free, ideally - put that phone away!) I often find I come home feeling inspired and ready to create something new. Go for a walk, take a sketchbook and see what that pencil can manifest on your paper. Whenever I am struggling with anything at all, I like to write. The scramble of thoughts and worries in my head often seem more manageable and far less intimidating when written down on paper. When I am having a period where I feel my creativity is dipping, I like to write about my goals and aspirations. Sometimes, my lack of creativity can imply a lack of confidence in the direction that I am heading in. I find focussing my mind on where I want to be through writing can lead me back on the right track; either by reassuring myself I am doing the right things, or by highlighting where I should be going instead. If I’m not feeling inspired myself, I often find that focussing more of my time on inspiring others can be just the thing to re-ignite my creativity. I am fortunate to have been given the opportunity to do some teaching over the last 6 months, and being able to share knowledge and ideas is often just as beneficial for the teacher as the students! This doesn’t mean you need to suddenly start arranging art classes - you could ask a friend or family member if they’d like to do some painting with you, and teach them what you know! Another way I like to do this is just simply hopping onto other artists social media channels - obviously this can be a great source of inspiration in itself, but also leaving positive comments, or sending them a message and starting a conversation, can help spark your own motivation as well as encouraging and inspiring them. Cognitive fatigue is a thing. I often feel quite a lot of guilt when I feel so utterly exhausted after a day of painting! I have long days marching up and down hospital wards to compare with my painting days, and can’t believe I can feel just as tired after a day of sitting as I do after a day at work. Being creative uses a lot of our mental energy, of which we sadly don’t have unlimited reserves. Drawing, painting, illustration takes a lot of hard concentration. Having a lapse in your creativity and drive may just be a sign that you need to take a rest - be it a day, a week, or even longer. Just because we are doing what we love, doesn’t mean we don’t need time away from it at times. Picking some other creative hobby can be a fantastic way to take a break from the project you are feeling less than motivated by. I have recently started doing some embroidery - still botanical! 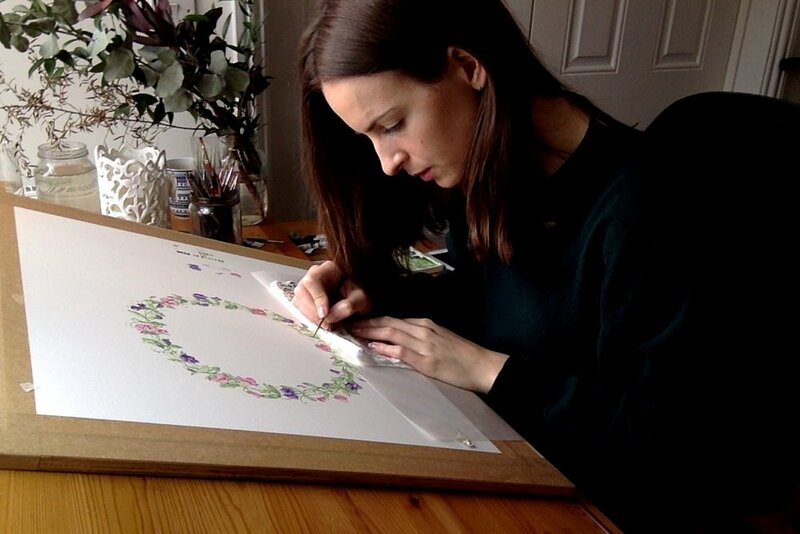 I have loved having a different creative outlet whist accepting that I am facing some struggles with my current projects - and guess what - I am now inspired to see if I can translate my own botanical illustrations into embroidered designs! Where did that come from!? If you are in the situation where you know that you love what you do, but are having this lapse in motivation and creativity, be confident that it won’t last forever. It is different to being unmotivated because you don’t enjoy what you’re doing (although it’s worth making sure that this isn’t, in fact, the case for you!) From experience (this has happened to me a number of times in my life so far), it does pass. Sometimes it just needs some time. I wonder if it is just our brain resting and preparing for bigger and better things to come?